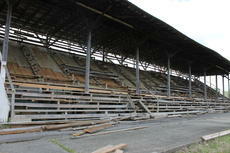 Pictured is the current state of the grand stands at the LaRue County Fair Grounds on Monday April 15, 2019. ‘I don’t know’…. ‘I don’t remember’….’I heard’ and ‘I was told’ dominated the gathering of LaRue County Fair Board members, stockholders and concerned community members Thursday April 11. ALES Artist of the Quarter! Pesticide certification: Who needs it?